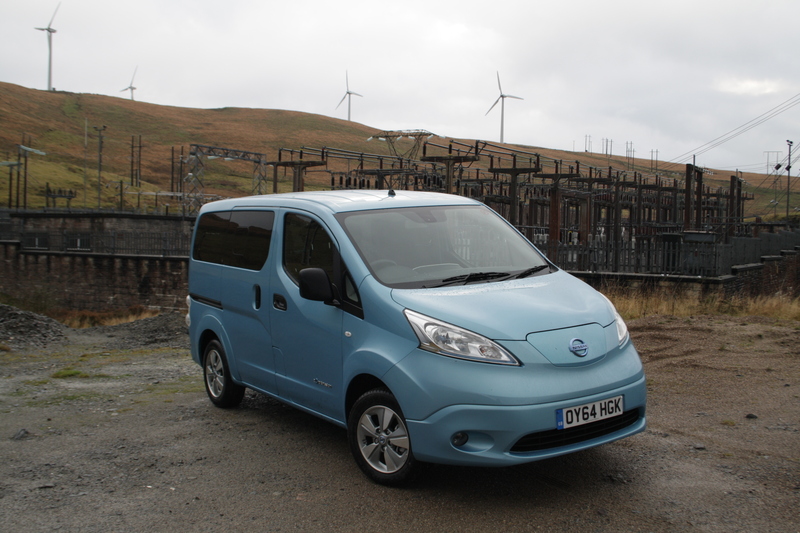 First thoughts – Nissan e-NV200 Combi electric – HubNut – celebrating the average! I’ve spent the past week test driving a Nissan e-NV200 Combi Tekna Rapid Plus – and what a thorough test it has proved to be! A 400+ mile road trip, hauling timber, band members and instruments around and shuttling friends to and fro – it was a week of 600 miles of very varied driving, and an awful lot of fact-finding. In fact, there was so much fact-finding that I have decided that one blog post simply isn’t enough to cover all bases. So, I’ll begin with first impressions and you’ll have to wait for things like The EV Roadtrip and more detailed impressions. Having conducted one of the most thorough tests of the e-NV200 Combi so far, it only seems right to go to a lot of effort in presenting my findings. In short, the e-NV200 is Nissan’s first converted electric vehicle. It takes the impressively practical NV200 Combi – a van with seats and windows – and adds the running gear and battery pack of the Nissan LEAF – one of the first mass-market electric cars, and one of the most successful thus far too. A winning combination? Let’s see. In terms of sheer space, the e-NV200 scores well. The boot is enormous, with a handy load cover that is easy to fold back or remove entirely. The rear bench has a 60/40 split and you only need to tug on a few handy tags to fold the bench away. The sliding side doors are a huge boon, especially in a tight car park. The driving position is high and mighty, but I must concede that I found it difficult to get comfortable. 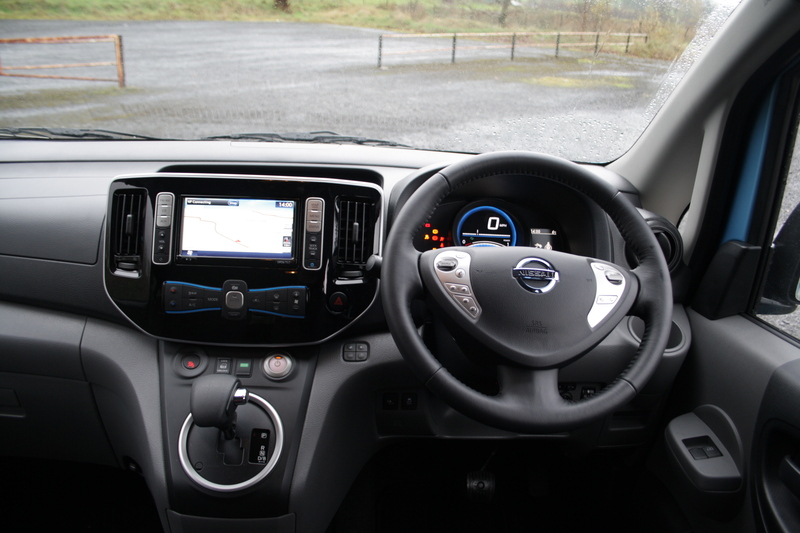 The steering wheel – lifted from the LEAF – sits at a rather jaunty angle. You can adjust that angle, but I found it was always too far away. Telescopic adjustment would have been nice. Similarly, height adjustment of the seat would be handy as I found under-thigh support a bit lacking. Mind you, after a lengthy trip to Devon, I wasn’t aching when I got out, so it clearly wasn’t too bad. To set off, you put your foot on the brake pedal and press the ‘on’ button to wake it up. The transmission selector is very similar to an automatic, and the car behaves like one too. Select D, release the brakes and the e-NV200 will creep forward like an auto. Disconcerting for those used to manual gearboxes, but something you learn to live with. I can’t really imagine it behaving any other way. Moving the gear selector sideways activates B mode, which gives a stronger engine brake feel and boosts regenerative braking. This is where the electric motor becomes a generator as you slow down, which helps preserve battery life and extend range. I live in rural mid-Wales, so there are lots of hills. That extra engine braking is much appreciated, and in one day, I could regenerate as much as 9kwh of power – enough for 21 miles of driving. The brake pedal has two functions. Press lightly and it boosts regeneration further. A little harder and the actual brakes kick in. I found it hard to notice a difference, but stopping power is certainly impressive. You need a light foot. That is somewhat at odds with the throttle pedal. Really, you should always be in Eco mode, to maximise range. However, that dulls throttle response, and the pedal needs a good shove. The point is to make it harder for you to accidentally use too much throttle, and harm range. I found I only turned Eco mode off to gain a power boost. Actually, pressing the throttle fully to the floor does the same thing. There’s a detent to try and stop you doing that. It’s very effective, as is the display below the speedometer which shows how many ‘bars’ of power you are using. Naturally, fewer bars is good news. The blue bars indicate when regeneration is taking place, and are also nice to see. It’s all pretty intuitive, even if the controls feel a bit synthetic. The electric power assistance gives a particularly numb feel. That was the biggest complaint from my wife, for whom this was her first drive of an electric vehicle. She didn’t like the creep function either, due to her lack of experience with automatics. Yet, she adjusted readily. EVs are not difficult to drive. Ergonomics leave a bit to be desired though. Buttons are scattered all over the place, and are not always visible or easily reached. Just like a 1980s Japanese car in fact! The big touch screen gives ready access to sat nav and further information about what the car is doing. On the move, it’s all strangely quiet at first, but wind and road noise soon build up – far more so than the LEAF. That’s not surprising. Vans have a big, boomy noise chamber in the back. Even though the Combi is a bit smarter inside than a van, there is still a lot of bare metal, and the simple trim boards can rattle at times. 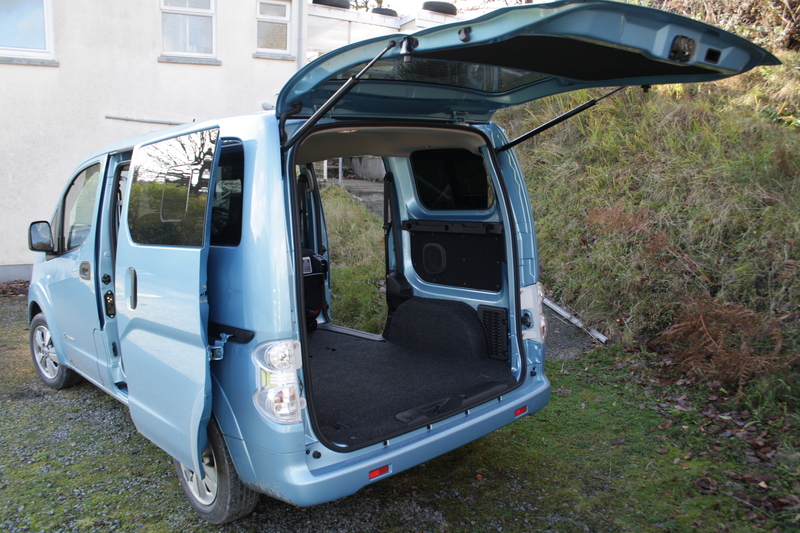 The ride is also rather bouncy, as the e-NV200 is designed to have a payload of over 700kg. Plenty of room, but simple trim may be off-putting for some. I like simple myself! Soon though, you almost forget that it is powered by electricity. Right up until the moment you stop! It’s eerily quiet and quite a novelty. Traffic jams are almost fun! Speed is controlled very much by the throttle. There’s very little need to touch the brake pedal most of the time. The general quietness and need to maximise range mean you drive more smoothly too. It’s all rather relaxing. There’s plenty of power if you need it though. Overtaking urge is strong, and it’ll fly up hills with no bother at all. You do notice the dramatic effect such driving has on range though. Such hooliganism is definitely not encouraged. In general driving terms, we found the claimed 106-mile range absolutely impossible to attain. 50-60 was far more realistic allowing for the hilly terrain and the fact that the test was conducted in late November. The heater saw a lot of use! That was entirely deliberate – winter conditions need to be checked. Still to come – our experiences on a 400-mile roadtrip, load lugging, people moving and practicality and a discussion about the future of EVs (electric vehicles). Then I’ll start talking classics again. Promise! Feel free to ask questions and leave comments – I may even be able to address them in later posts.